While there are people who have become famous, thanks to things they have done, there are others who have become popular due to their association with other famous people. 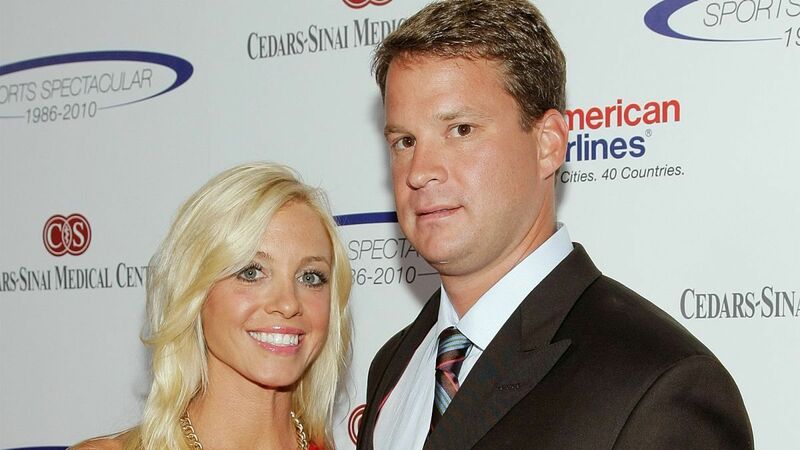 It was by association, through her marriage to American football coach Lane Kiffin that Layla Kiffin is known. That stated, even after the marriage had failed, Layla has managed to sustain the interest of a lot of people. Here is all you need to know about her. Layla Kiffin was born in 1976 in the United States, but the exact place of her birth is unknown. She is the daughter of former All-American quarterback John Reaves who spent 11 seasons playing in the National Football League (NFL). He also spent 3 seasons playing in the United States Football League (USFL). Layla’s father played for different teams including the Philadelphia Eagles, the Cincinnati Bengals, Minnesota Vikings, and the Tampa Bay Buccaneers. Following the end of his career as a footballer, he went into coaching. Layla was brought up together with her brother David Reaves and another sibling by their father after he got separated from their mother early in his football career. At the time, John Reaves had a lot of personal battles he was fighting including his wife divorcing him, as well as the deaths of his mother and stepfather. This led him to drug problems. Nevertheless, he still managed to raise his three kids. Brought up in different parts of Florida including Gainesville where she spent 2 years, Layla Kiffin attended the Buchholz High School. From here, she moved to the University of Florida in 1992 and graduated in 1996. Interestingly, it was from the same university that both her parents graduated from and her father played for the institution as an All-American quarterback. After she graduated from the UFL, Layla worked with the Tampa Bay Buccaneers. At the time, Lane Kiffin’s father worked as the Buccaneer’s defensive coordinator. It was when Lane Kiffin came to visit his father in 1999 that he saw Layla. Almost immediately, the two began a relationship that would lead to an engagement within a short time and then finally to the altar by 2004. At the time, Lane Kiffin was a graduate assistant at Colorado State. He was born Lane Monte Kiffin on May 9, 1975. An American football coach, Lane has worked as the offensive coordinator at the University of Alabama and USC Trojans football at different times. He was also the head coach of the University of Tennessee Volunteers, Oakland Raiders. Kiffin is presently the head coach of the Florida Atlantic University and was at a point, the youngest NFL head coach in its recent history. Layla and Lane Kiffin’s marriage is blessed with three children; Landry (born in 2005), Pressley who was born in 2007 and son, Monte Knox Kiffin born in 2009. The two remained together until March 2016 when Layla Kiffin asked for a divorce, citing irreconcilable differences. In a statement by Lane Kiffin, both he and Layla had come to a mutual agreement to get a divorce, even though they are still going to be committed to raising their kids which he described as their top priority. Before the split, Lane got into a rather messy case in which the man was rumored to be involved in an affair with some unknown high profile Alabama lady. Apart from that, there was also another unverified rumor just like the other, that he also had an affair with Nick Saban’s daughter, Kristen Saban. Nick was the head coach while Lane was the offensive coordinator of the Alabama Crimson Tide football. Even as the rumors were not substantiated publicly with evidence, it is not clear if it had anything to do with the divorce. Where is Layla Kiffin Now? Following the divorce, Lane Kiffin revealed that his ex-wife was awarded 34.5% of his earnings. More so, although she asked for joint custody of their three children, Layla Kiffin also asked and got the physical custody of all the children while her husband was only allowed to visit them. Although it is not known if she works, it is reported that Layla and the three kids now live in a rented house in Manhattan Beach, Calif. that costs $10,000 each month. This is while her ex-husband is in Florida.